After sitting down and thinking about how I was going to tackle creating an interesting story that others would want to read, I asked myself, what elements in a story transform an average story into a strong, moving and believable story? I sat there while ideas formed in my mind and I began to scribble them out. I realised that when I would look over them later, that I wouldn’t be able to understand them, I would have to read them all again; and there is no efficiency in that. Thinking about it a little more, I realised that the easiest way to view all of the aspects is to utilise a platform that makes it quick and easy to view all aspects that will be needed to create a captivating story. I decided that a visual form would be the easiest way to portray the information, and a flow chart or mind map would be the best way to display the different aspects. The first step is to look at the story as a whole. Writing a complete story that has depth and keeps your audience captivated requires talent. The question is, how do you do this? What aspects need to be covered to ensure that the reader can form a complete world within their own mind? To tackle this, think about when you have told a story to someone. When you describe a situation to your audience, the outcome you are looking for is an emotive response; laughter, shock, disbelief, anger, relief. How do you go about doing this? Initially, you will introduce the situation – describing the person(s) involved, the environment they are in and the dilemma they face. You then add in descriptors, adding extra weight to the story. You could imagine this as drip of water forming on a stalactite. You slowly build up the water drop, drawing more information into the story, making the drop bigger and bigger until the tension reaches a desired level. The story then enters the change stage as the drop slips from its base and begins freefalling. The conclusion occurs as the drop hits the floor; all the emotive responses are experienced and the audience feels a sense of relief and fulfillment from the ending. You do this as a storyteller everyday when conversing with others. The challenge is to take this ability and expand to create a lengthy story. 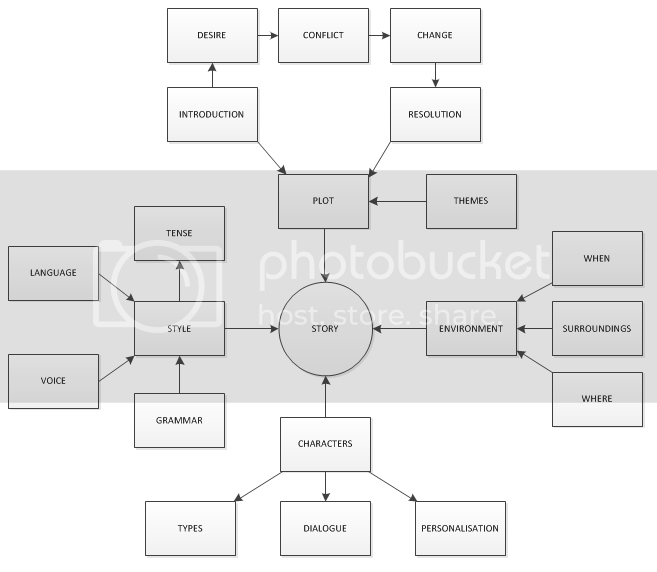 Following on from this, the mind map below outlines all the basic requirements for a story to be captivating. I will continue to look as I begin plotting out my idea for areas I haven’t covered, so keep this page bookmarked for changes! There may need to be more added if I think of anything else, but for now, these are the main aspects that need to be addressed when writing a story. In my next post, I shall begin to delve into each of these areas and explain their sections.